Lena Gurr was born in Brooklyn in 1897. She studied at the Brooklyn Training School for Teachers, Educational Alliance Art School, Arts Students League with John Sloan and with M. Sterne in Paris. Gurr was a member of the Artists League of America, National Association of Women Artists, New York Society of Women Artists, Brooklyn Society of Artists, Audubon Artists and the American Artists Congress. 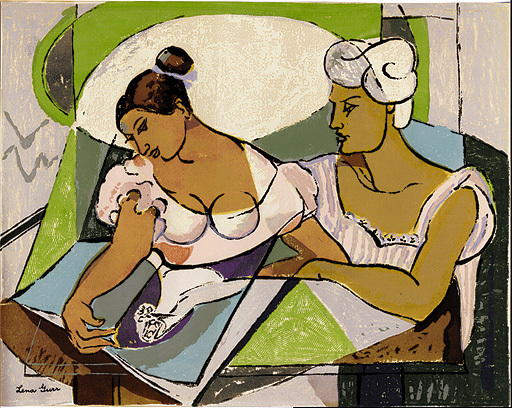 She exhibited in many of the shows held by these organizations as well as the Whitney Studio Club, National Academy of Design, Virginia Museum of Fine Arts, Brooklyn Museum, World's Fair (1939) and had three solo shows at the ACA Gallery (1935, 1939, and 1945). Gurr's work is represented in the collections of the Biro-Bidjan Museum in Russia and the Library of Congress. In addition to her career as a painter, lithographer and serigrapher, Gurr also taught art in the New York City public school system. Lamentation -- c.1935, Color Serigraph. Edition not stated. Signed in ink in the image, lower left. Image size 10 x 12 inches (254 x 305 mm); sheet size 12 x 14 1/16 inches (330 x 358 mm). A richly textured, fresh impression, with margins (1 to 1 1/2 inches), on heavy warm grey wove paper. Slight toning to the sheet edges verso and brown tape in the upper sheet corners verso, otherwise in excellent condition. 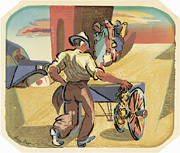 Bride to Be -- c.1935, Color Serigraph. Image size 15 3/16 x 19 1/8 inches (385 x 528 mm). Sheet trimmed to the image edge. A richly textured, fresh impression, trimmed to the image edge with hair line margins, on heavy cream wove paper, in excellent condition. Untitled (Pushcart) -- c.1935, Color Serigraph. Image size 10 1/8 x 12 inches (257 x 305 mm); sheet size: 10 7/8 x 12 3/4 inches (276 x 324 mm). A fine impression, with fresh colors, on heavy cream wove paper; the sheet corners trimmed diagonally to conform with the image; with margins (3/8 inch). Brown paper tape remains in the top left and right sheet corners, verso, otherwise in excellent condition.